I want extend the ring circuit in my main bedroom to add a further double socket, perhaps two. The existing setup is there is two double outlets in the room. One as soon as you walk in and one on the opposite side of the room. The one has you walk in is shown in the first pic is the double socket with three cables going to it. One of those cables goes to a fcu on the other side of the wall which powers the second double socket. Inside the fcu shown in third pic there are also three cables. 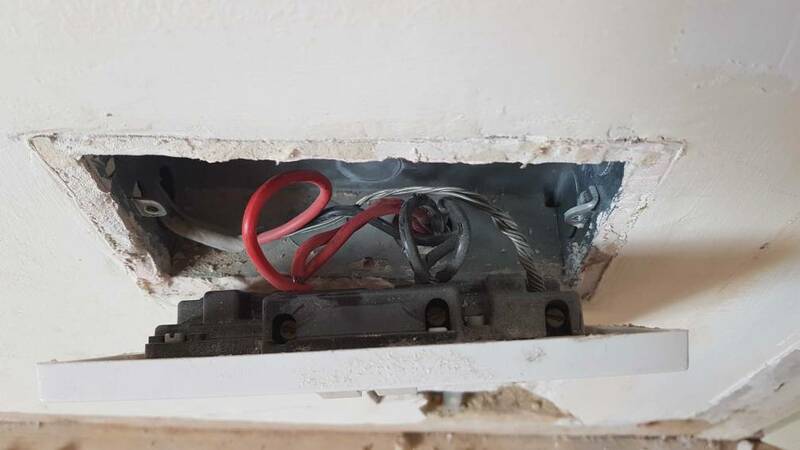 One is the supply connection from the other socket, one is a cable linked to the double socket to the side of it and the other appears to go downstairs (see last pic). It looks as if the fcu is part of the ring main, but I'm just a bit confused as to why a fcu has been used. I thought they were normally used if you were taking a spur and then spurring again? The only thing I don't want to do is remove the cable from the fcu and use that to extend the ring main then find out it was actually a spur all along! It may be the cable is not going down, but coming up? You really need to find out which cables are the ring and which are not. Then you can easily "break into the ring" and add more sockets. How do you determine that, just do continuity tests? Does it matter if the cable is coming up or down if its still part of the ring? No it does not matter which way direction a cable goes for a ring, I was just wondering if it comes up from downstairs across all sockets and back down some where else? Yes you can conduct a continuity test to find out what a cable does. Bear in mind ELECTRICITY OFF first and as its a ring you will have to disconnect both ends of the cable. Cheers. I did do a continuity test earlier to determine which cable went from socket 1 to FCU and marked it. Just need to work out where the other two go! 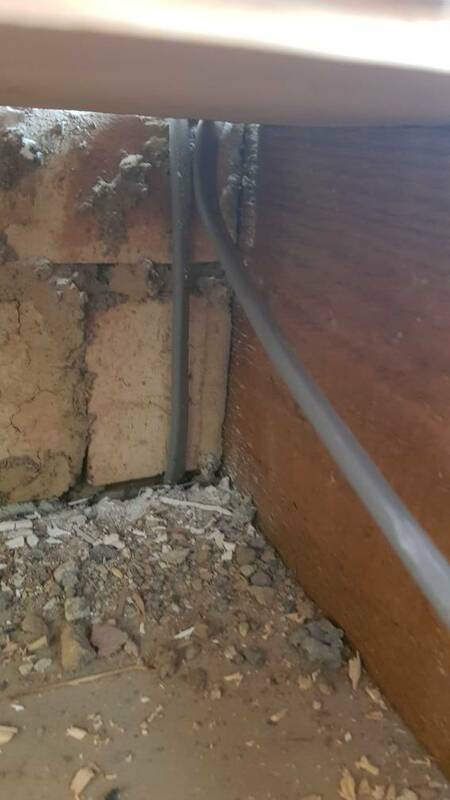 So I decided to check for continuity from the fcu to the socket in the lounge downstairs to see if they are connected as part of the ring. The short answer is they are connected but not as a ring. So it looks like the fcu is a spur which powers the double socket to the left of it. There is then a cable that goes from the fcu to downstairs. This then feeds a double socket in the lounge. The double socket only has one twin and earth cable connected. So it's looking like a spur off a spur. But to protect the circuit he has put an FCU which will blow in the event of too much current being drawn from either of the sockets. Do you think i'm correct? 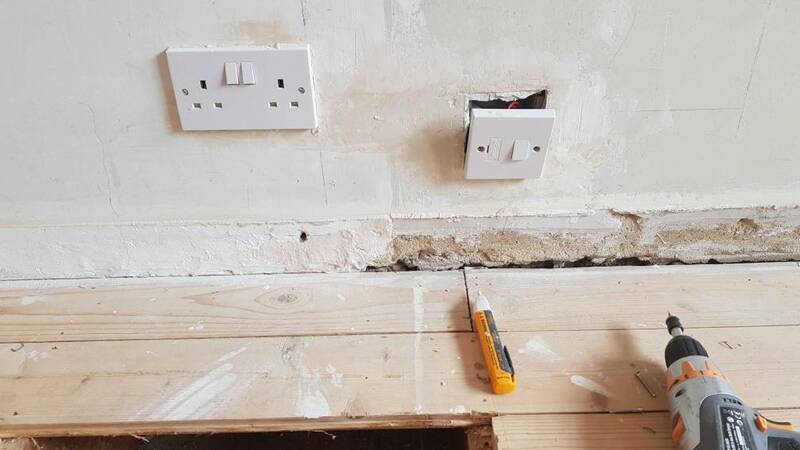 The only thing I don't get is the downstairs socket looks much older than the upstairs, I wondered whether it would have originally been wired this way!? Its not possible to say if you are correct or incorrect since it was you who made the drawing. The only way to answer your question is to have a second opinion by a person looking at your wiring. 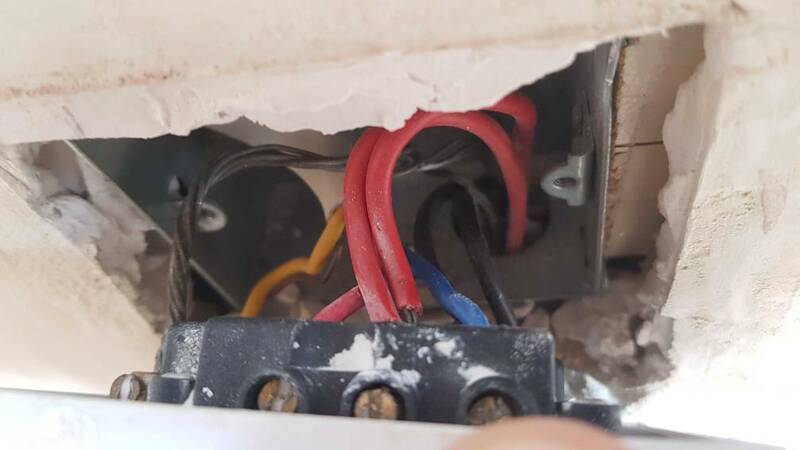 If it were me (and it isnt) I would be looking at rewiring just that bit so it all on the same ring and do away with the fcu. Yeah I understand from a safety perspective what you mean there. Exactly what I was thinking, lose the fcu and probably lose the downstairs socket and wire two new sockets on the ring circuit. I think you are jumping, you need to look at the basics first. 1) With a ring final there will be continuity between two cables. 2) With any circuit there is a maximum amount of cable, in the case of a 32A ring that is 106 meters. 3) You clearly need some meters to work this all out. So with a full set of meters it is easy, selecting the loop impedance meter we first look to see how close to the limits we already are. We are looking for the socket reasonably central to the ring, we are looking at around 0.59 ohms more than the incomer loop impedance to comply with volt drop, so around 0.94 ohms line - neutral is a typical limit. The line - earth can be higher, around 1.37 ohms. You don't need to use a loop impedance tester, a low ohm meter using at least 200 mA to test with could also be used. i.e. a simple multi-meter will not be suitable. So for DIY the fused spur, which is in real terms a 13A radial is simpler, the ELI limit was 2.42 with 13A fuse, not sure if that changed with amendment 3? but the main point is one is unlikely to exceed the limit. From the consumer unit one could use around 53 meters of cable for a 13A radial, and 42 meters for 16 amp, and 32 meters for 20 amp. So this is clearly reduced when taking it from a ring final, but in real terms one is unlikely to exceed the limits within the house. In my own house I found a fault, because I can't correct it at the moment my ring final has been dropped to 20A as no longer a ring. There is a second ring, but this only feeds the extension, but with 20A the trip has not opened and I think in the main any excess of 20 amps is so short it will never trip. OK 13A a bit less, but also a fuse is slower acting, it is unlikely you will ever rupture the fuse with a 13A radial (fused spur) unless there is a fault. I have two one cup kettles in my kitchen both from the 20A MCB I make coffee for my wife and myself at the same time using the two kettles so around 25A plus what ever else is running, it does not trip the 20A MCB. In view of all the special testing equipment required, before you can extend a ring final, I would stick with a fused spur. The house is a three bedroom semi, I can't imagine there is more than 106 meters of twin and earth on the ring, although the ring does feed both ground floor, first floor and kitchen. Once the kitchen is finished that will be on it's own ring circuit. Will check a plug socket with just two cables to see if both lines have continuity. From three onwards you've lost me I'm sorry. Sorry only just seen this. First pic. I'll have a look at the rest of the thread tomorrow. Yep! will be getting rid of that wiring! Also my friend said the cabling used from the FCU to the mains double socket is incorrect too. Also there is no grommit in the metal backbox where the cables come through! gets better and better this! If I wanted to extend the ring circuit, using my picture - the lower double socket where I have a question mark over both of those cables. 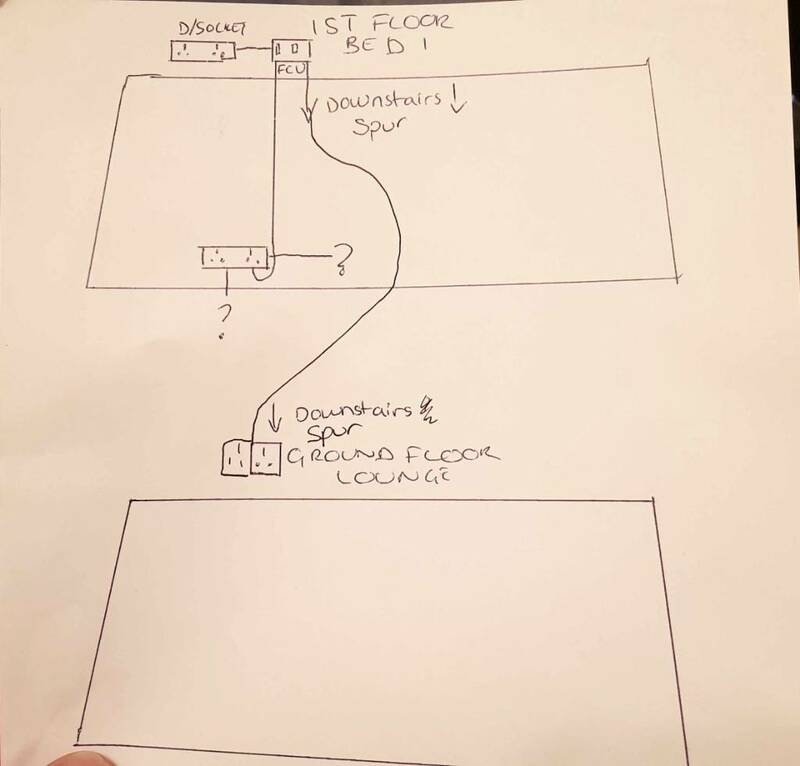 I am assuming they are part of the ring, would I be right in checking which other socket they go to (continuity test) then running my extension between those to the other sockets I want in the room, then looping back to the original double socket? Do a continuity test at the socket. Power off, take the red cables out of the socket and see if you have continuity between them (less than one ohm). The other way is to separate the lives, make safe with strip connector ,power up and see if you have two live wires. Thanks, I phoned my mate who is a sparky and he said the same, but he mentioned testing the two neutrals too. He said I need to run my new cabling back to the socket then connect one end with the existing wiring to the socket and through crimp the other new wire to the existing wire. While I'm at it I will remove the spur fcu and get rid of that part of the circuit too. Many thanks for your help all.